This is a 4.4 mile round trip hike with 200 feet of elevation gain. Located at the end of Kings Canyon, at Road’s End. This trail is a nice stroll through the woods with the peaks of the High Country towering above. You will come to a fork in the road but keep right towards Bailey Bridge and Bubbs Creek. You won’t miss the bridge, with 360-degree picturesque views and a river flowing underneath. Below Baily’s Bridge, there are sandy river beds that mare a perfect place to for a swim and to have lunch. Past Baily’s Bridge, the trail continues via Bubbs Creek to the Rae Lakes Loop and gets steeper. When you’re ready to head back, just follow the trail you hiked in on. This is a 4 mile hike with 600 feet in elevation gain in a glacial carved valley. The trail starts from Lodgepole Campground. Cross a bridge to the left and you’ll see the trailhead. Despite how popular this trail is, there will be stretches of the hike where you will have trail to yourself. 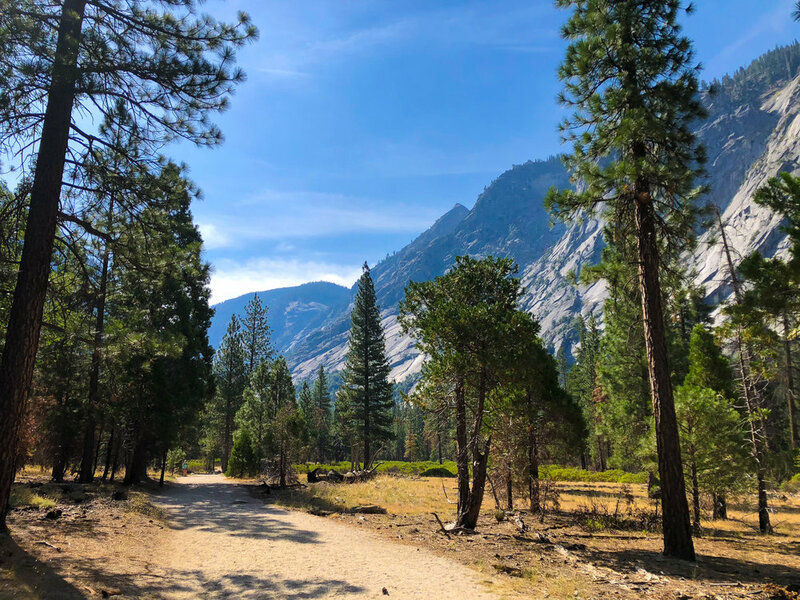 This trail passes by meadows with granite peaks towering overhead. Deer, marmot and bear wildlife sightings are also common. Along the trail you’ll see a river with kids wadding in it. There are rock pools along the river that make it a great place to take a swim. During peak run off times in the spring and early summer months (through mid-July), when the snow is melting in the High Country, be cautious when attempting to swim. Although it looks easy flowing on the surface, it can be very fast moving under the surface. Drownings have happened. This is a 3.3 mile round trip hike with 793 feet of elevation gain that opens up to beautiful 360-degree views. The trailhead is just south of Dorst Campground from the Generals Highway and marked by a large sign on the side of the road. The trail starts with a few switch backs, and it proceeds primarily through the forest. It then opens up to a false summit with not many views but keep going and it will open up at the top of a granite dome. At the top, you will have 360-degree picturesque views of the park, San Joaqin Valley, and the High Sierra. If you look carefully on a clear day, you’ll be able to see Mt. Whitney to the east. **If you are going to take a swim, make sure to rinse off any sunscreen or bug spray away from the water source. This helps protect the ecosystem and prevent an oil slick on top of the water. **Although the water might look clean, don’t drink it without properly filtering it for giardia and e-coli. See post about why you need to filter water and suggested filters.